Even though many companies today rely heavily on online communication, print is still the picture book that provides inspiration. Our print range is extremely diverse – it is sure to include something to suit you! We not only meet all basic requirements and comply with the postal regulations, but we will also convert your requirements regarding a selective approach to your target group and exceptional design into an actual product – while always maintaining our focus on keeping costs as low and production times as short as possible. Why not get an overview of the range we offer? You are sure to be impressed! With us, you can be sure that your mailshots will always be well received. We put your ideas into practice and ensure the successful implementation of your campaign. A highly personalised touch from you and professional implementation by us mean that nothing can stand in the way of your success. We offer a comprehensive range for impressive results. 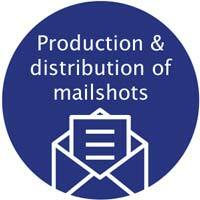 Do you want to send out mailshots with a covering letter, give-aways or response elements? Then why not choose from our lettershop range: mailshots in envelopes! Personalising mailshots is vital if you want to build up and maintain customer relationships. Thanks to processes such as ink jet labelling – also available in full-colour digital printing – or laser printing, every option you could possibly require is available in our lettershop! Following production in our in-house lettershop, we send out your promotional materials via Deutsche Post or the major private carriers. Whether for delivery at home or abroad – we will find you the most cost-effective postage option. We also consider a partially addressed promotional approach to be an efficient means of acquiring new customers. The Postwurfspezial is also ideally suited to generating addresses and inviting people to the point of sale. Take advantage of the full service offered by Trebbau! Whether it be a receipt for a donation, an official notification or an invoice or contract document – every personalised document gives you the opportunity to convey important messages to your customers and to create a positive customer experience. Don’t let the potential of your printed transactional documents go to waste!